While the Millennium Development Goals (MDGs) represent a concerted effort to address global poverty, there is a striking gap in the current MDGs and their inclusion of persons with disabilities. The estimated 1 billion people worldwide who live with disabilities are still excluded from equitable access to resources such as education, employment, healthcare and social and legal support systems. As a result persons with disabilities experience disproportionately high rates of poverty. With the adoption of the Convention on the Rights of Persons with Disabilities in 2006, some progress has been made in improving the situation of persons with disabilities. However, in spite of such gains, disability remains largely invisible in most mainstream development processes, including the MDGs. 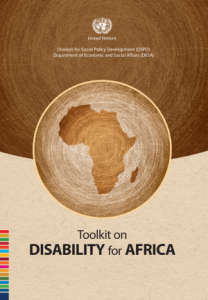 Greater efforts are needed to ensure that development processes include persons with disabilities to help realize the overall objective of the full and equal participation of persons with disabilities in society. In 2010, the General Assembly in its resolution 65/186, proposed the convening of a high-level meeting on disability and requested further information from the Secretary-General in this regard. The Secretary-General submitted his report (A/66/128) on strengthening efforts to ensure accessibility for and inclusion of persons with disabilities in all aspects of development efforts and explored options for priorities and possible outcomes for the proposed high-level meeting. Subsequently in 2011, the Assembly adopted resolution 66/124 and decided to convene a one-day high-level meeting of the General Assembly on disability (HLMD) at the level of Heads of State and Government on 23 September 2013, the Monday before the start of the general debate of the sixty-eighth session. Under the theme: “The way forward: a disability inclusive development agenda towards 2015 and beyond”, the HLMD will comprise of a plenary meeting and two consecutive informal interactive round tables. Participation in each round table will include Member States, observers and representatives of entities of the United Nations system, as well as representatives of civil society, organizations of persons with disabilities and the private sector. The HLMD will result in a concise, action-oriented Outcome Document in support of the aims of the Convention on the Rights of Persons with Disabilities and the realization of the Millennium Development Goals and other internationally agreed development goals for persons with disabilities. Prior to the convening of the HLMD in September 2013, a draft text of the Outcome Document will be produced by the President of the General Assembly in consultation with Member States, along with input from organizations of persons with disabilities through informal consultations. General Assembly resolution 66/124 invites the President of the General Assembly to draw up a list of representatives of non-governmental organizations in consultative status with the Economic and Social Council who will participate in the HLMD (paragraph 6), as well as a list of representatives of other non-governmental organizations, organizations of persons with disabilities, relevant civil society organizations and the private sector who may participate in the high-level meeting (paragraph 7). Access to UN Headquarters will be via 46th street at 2nd avenue. Only those with a non-transferable Entry Pass and photo ID will be allowed to enter the NYPD checkpoints at 2nd avenue before being escorted to the UN complex. UN Staff will be available at 47th street and 2nd avenue to provide further information and assistance. Urgent registration inquiries can be directed to ngo@un.org. Due to the ongoing renovations of the UN complex and the opening of the 68th session of the General Assembly, participants are reminded that space will be limited and access to parts of the complex may not be available. Travel between buildings without the necessary Entry Passes will not be permitted. Some side-events may need special entry passes. Leaving UN Headquarters will be via the 47th street exit at the UN complex. Participants are expected to exit the building at their earliest. Those requiring special arrangements such as a car service are requested to provide detailed information by 11 a.m. tomorrow to (requesens@un.org), as this information must be provided to the New York City Police Department (NYPD). Such transportation will need to checked and screened before being allowed through the security perimeter on 2nd avenue to the pick-up point on 1st avenue and 47th street. Kindly provide the car service vehicle description, license plate number, time of pick-up and destination for forwarding to the NYPD. Letter dated 10 September to all Permanent Missions and Permanent Observer Missions to the United Nations regarding the Ouctome Document to be submitted as official document. Letter dated 10 September to all Permanent Missions and Permanent Observer Missions to the United Nations regarding the special requirements for delegates attending the HLM on the realization of the MDG and other internationally agreed development goals for persons with disabilities. Letter dated 10 September to all Permanent Missions and Permanent Observer Missions to the United Nations regarding the High-level meeting on the realization of the millennium Development Goals and other internationally agreed development goals for persons with disabilities. Letter dated 5 September to all Permanent Missions and Permanent Observer Missions to the United Nations regarding the Draft Outcome Document for the HLM on MDGs on Disabilities. Letter dated 25 July to all Permanent Missions and Permanent Observer Missions to the United Nations regarding the High-level meeting of the General Assembly on the realization of the Millennium Development Goals and other internationally agreed development goals for persons with disabilities. Letter dated 19 July to all Permanent Missions and Permanent Observer Missions to the United Nations regarding the High-level meeting of the General Assembly on the realization of the Millennium Development Goals and other internationally agreed development goals for persons with disabilities. Letter dated 15 July to all Permanent Missions and Permanent Observer Missions to the United Nations regarding the High-level meeting of the General Assembly on the realization of the Millennium Development Goals and other internationally agreed development goals for persons with disabilities. Letter dated 5 July to all Permanent Missions and Permanent Observer Missions to the United Nations regarding the HLM on the realization of the Millennium Development Goals and other internationally agreed development goals for persons with disabilities. Letter dated 25 June to all Permanent Missions and Permanent Observer Missions to the United Nations regarding the HLM on the realization of the Millennium Development Goals and other internationally agreed development goals for persons with disabilities. Letter dated 12 June to all Permanent Missions and Permanent Observer Missions to the United Nations transmitting a letter from the Co-Facilitators on consultations for the draft outcome document of High level Meeting on the Revitalisation of the Millennium Development Goals and Other Development Goals for Persons with Disabilities. Letter dated 17 May to all Permanent Missions and Permanent Observer Missions to the United Nations regarding the High-level meeting of the GA on the realization of the Millennium Development Goals and other internationally agreed development goals for persons with disabilities. Letter dated 6 May to all Permanent Missions and Permanent Observer Missions to the United Nations regarding the High-level meeting of the GA on the Realization of the Millennium Development Goals and other internationally agreed development goals for persons with disabilities. Due to the high volume of General Assembly meetings and other events around the date of the HLMDD, DESA will not be coordinating side-events. Member States, UN agencies and other organizations conducting HLMDD-related side-events at UN Headquarters or their Missions, offices and other locations, should provide the information to DESA for posting on this website.